But at a time when fabricated stories can circle the globe, gaining currency through the power of automated algorithms, while inconvenient claims are defiantly dismissed as ‘fake news’, the power of historical knowledge can be seen more clearly than ever to derive from its roots in a disciplinary community. Giving young people access to genuinely powerful knowledge means equipping them with sufficient knowledge of the academic community’s shared (and socially constructed) standards: an appreciation of the grounds on which historical claims may be advanced and validated and the grounds on which they may be legitimately challenged. Teaching history can thus be seen as a process of ‘opening doors’: giving young people knowledge that they can use to participate in society: to make decisions for themselves and their families; to engage in community action; to follow and to join political debate. It is precisely because historical knowledge and understanding brings with it power that it is so important to ensure that all young people are given equal access to it – in ways that will alert them to its potential for their own lives. Yet, as the Royal Historical Society has recently reported, many young people, who have so much to gain from a fuller knowledge of the past, are cut off from that knowledge and allowed to believe that history has nothing to say to them. The RHS report, Race, Ethnicity and Equality, is obviously most concerned with history teaching at university level in the UK, where it highlights racial and ethnic inequalities and draws attention to the under-representation of Black and Ethnic Minority (BME) students and staff in history programmes. Its findings, however, also have important implications for schools, pointing to the negative impact of narrow school curriculums and the fact that BME students are less likely to choose history for public examinations or, ultimately, for university applications. This results in a university cohort in which only 11% of history students come from BME backgrounds, compared to an average across all subjects of nearly 25%. Several of the articles and other features in this edition address these issues head on. Sophia Nzeribe Nascimento was concerned that her students in a diverse London school should see that the role of historian was one to which they could legitimately aspire. Her exploration of the characteristics that they attributed to historians alerted her to some of the unhelpful assumptions that young people can make (and that teachers may unwittingly perpetuate through their choice of resources) about the bases of historians’ authority and credibility. Chris Lewis takes up the call issued by the RHS for a more diverse curriculum, explaining how he used Miranda Kaufmann’s work to create a new scheme of work, introducing students to life in Tudor England. The call for a more diverse curriculum is not a call to distort the past to serve particular needs in the present. As Kaufmann has demonstrated through her detailed study of the lives of ten individuals, ‘the presence of Africans in Tudor England was common knowledge at the time’. It will, however, take a concerted, collaborative effort, of the kind that Lewis describes – one that involves historians working with teachers – to ensure that it ‘becomes common knowledge again’. The New, Novice or Nervous feature can help with that endeavour, offering a guide to previous Teaching History articles and other HA resources to support the inclusion of more BME history in the curriculum. 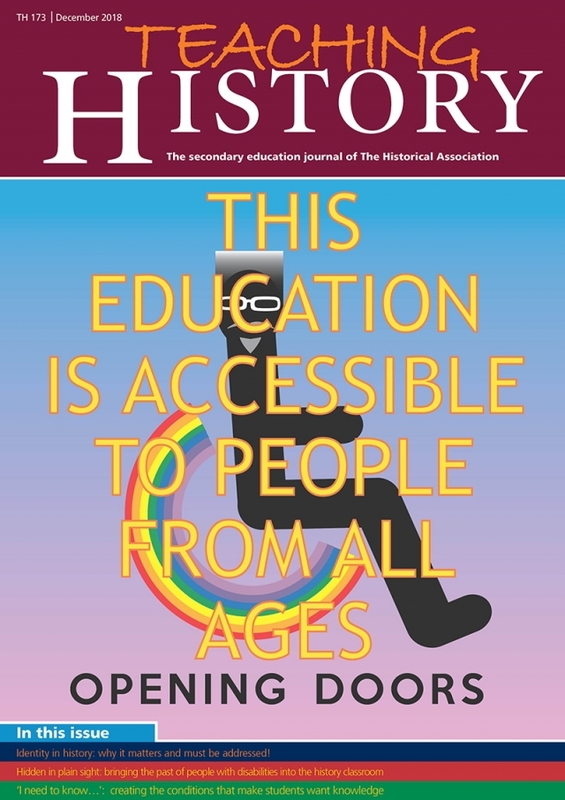 Professional collaboration to achieve a more diverse curriculum is also an important feature of the work reported by Helen Snelson and Ruth Lingard on bringing the past of people with disabilities into the history classroom. While that work is inspired by their commitment to the development of a society in which equality and human rights are deeply rooted, it also acknowledges the real pressures of time – on teachers and on the curriculum – in demonstrating how new content can be smoothly slotted in, rather than awkwardly bolted on. The other articles pick up on the theme of historical knowledge as power. Chloe Bateman focuses on the question of how she can inspire her Year 7 classes to seek that knowledge for themselves. Heather Fearn, looking closely at the differences between sixth-form students’ responses to unseen sources, examines the way in which secure substantive knowledge of other periods and topics, carefully built over time, confers power on those entering unfamiliar historical territory. Paula Worth, similarly seeking to empower young people to engage effectively in historical debate, takes us back, through careful consideration of what students can do by the end of each lesson, to the power of well-crafted enquiry questions.